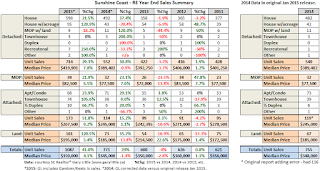 SC Realtor® Gary Little posts SC sales summaries twice a year: a mid-year summary and a year-end summary. You will find the link to those summaries above the data charts on Little’s sales stats webpage. I've taken Little’s data and put it a table format and combined it with previously released data from 2011 to 2013. In October 2015, Little made a major revision to his sales statistics past and present. He began including Gambier and Keats Island sales in the overall total; however, you wouldn’t pick up on this unless you were keeping tabs on the different market area totals. So, I’ve noted in the table below that Little’s 2014 and 2015 data includes those island sales while the previous years to not which should be noted when looking at the percentage changes year-to-year. 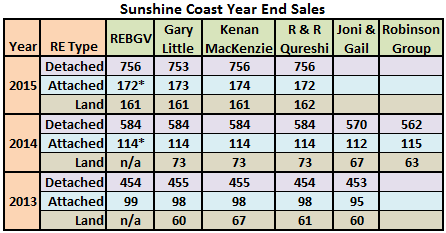 I believe the REBGV began to include the islands’ sales data with the SC data mid-way through 2013; previously that data was bundled with the Gulf Island sales stats. In the 2015 summary, Little also corrected an adding mistake in the 2014 data - I show the original info on the right. I point this out for anyone who is keeping Little’s summaries. 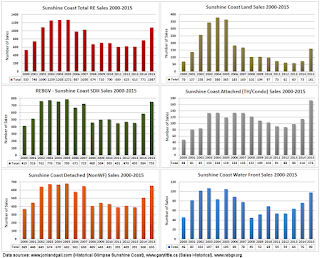 Next up are my own SC historical sales tables by type going back to 2000. 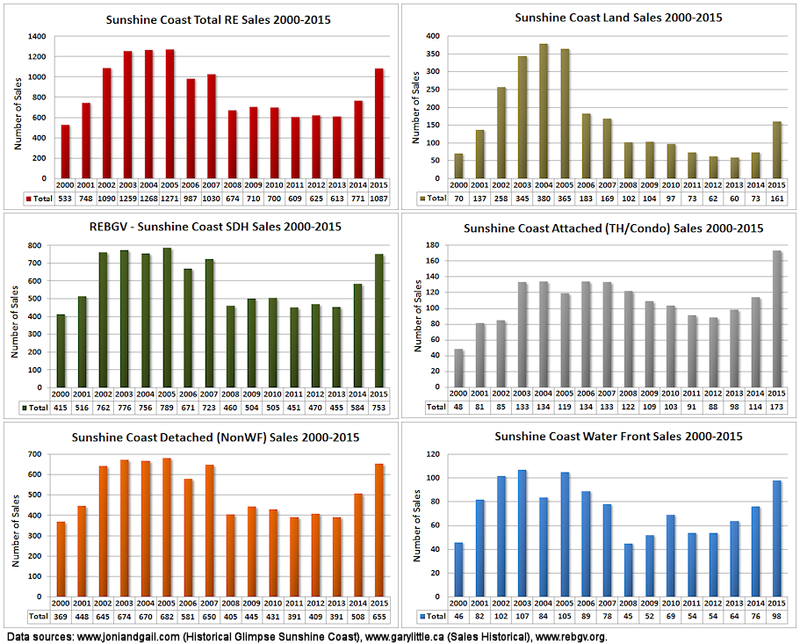 I noted the data sources and point out that the earlier years do not include Gambier & Keats Island sales. I have included those sales in the 2013-2015 data. 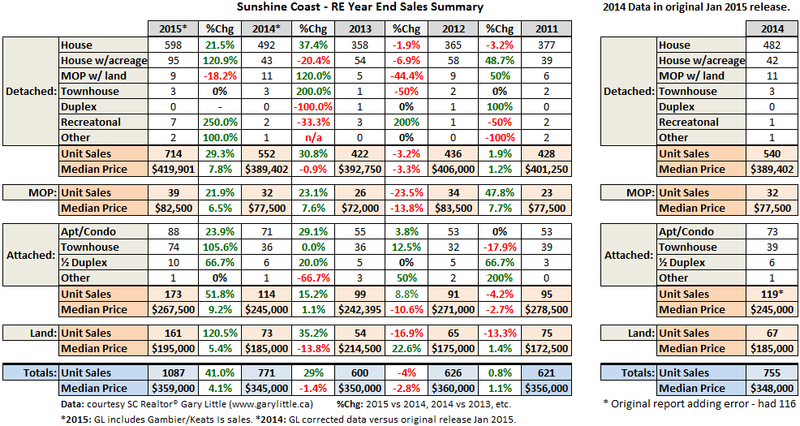 Here is a summary table of the Gambier and Keats Island sales for 2013 to 2015. 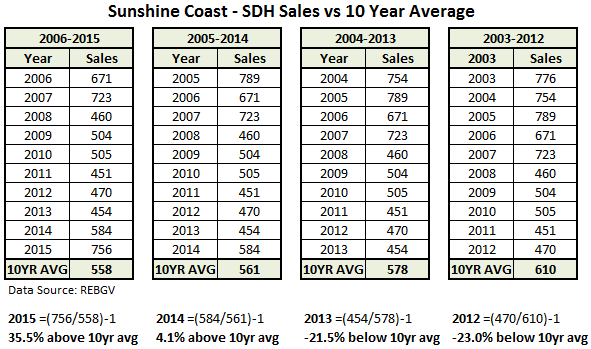 I have calculated the SC single detached home sales versus the 10 Year Average for 2012 to 2015. We can see that 2014 made a huge jump into positive territory (+4.1%) compared to 2013’s showing (-21.5%). 2015 built on that positive momentum closing the year up +35.5%. Finally, I’ve pulled together various sources of 2015 year-end stats to see how they reported the figures. I think those Gambier & Keats Island sales may be coming into play here in the 2014 sales stats, can’t say for sure. The variations are small and it’s noteworthy that the REBGV has, itself, presented different totals in its monthly stats package versus its Chart package. *114 - Attached total in REBGV Dec stats pkg.